This is the note of a speech I gave last night to the #techforgood meetup in London, at the Google Campus. The event was organised by the Resolution Trust. With their partners Bethnal Green Ventures, they are about to launch a new funding and support offer for “civic ventures that use technology to support the low wage workforce”. I spoke after Gavin Kelly, who sets out the case for the programme here. A note about why I decided to speak: if you, like me, believe in the union model, the continued criticism of unions for doing too little to organise low-paid private sector workers can get a little wearing — particularly when lots of the transformation efforts we’re engaged in are necessarily behind the scenes, and the victories are yet few. But unions feeling defensive doesn’t raise the pay of a single low-paid worker. And these criticisms are often from people who care about working people and see unions as part of winning great jobs for everyone. So, I decided to speak, and to support the Resolution Trust programme — and here’s (more or less) what I said. This wonderful pic is David Goodwin’s record of my speech — my favourite bit is the dinosaur! I’m here to speak for the trade union movement today — but that’s not my background. My whole career until 18 months ago was as an NGO campaigner — against domestic violence, at Shelter as their head of campaigns, at Oxfam. And the key question that life in NGOs taught me was this. If you want to make change, you have to understand — who holds the power? and how do I get some of it? Now I work for trade unions — trying to win great jobs for everyone. And power is still the key to winning change. Who holds the power? And how do we get some of it to win the change? That’s my key message for you today. As you wrestle with how we improve the workplace, you have to think about power. Otherwise we end up with tech that merely delivers greater convenience to people who don’t need it the most. When I was at Shelter, every few months I’d get a pitch from someone with a great idea to improve renting. “What we need,” they’d exclaim excitedly, “is a TripAdvisor for landlords!” But what they never got is that in much of the UK, renters don’t choose landlords. Landlords choose renters. Properties are scarce, so landlords can be choosy. So while TripAdvisor for landlords sounds plausible, it won’t help renters. And why didn’t they get this? Cos they had no analysis of power. And the same is true in the workplace. When they need to keep the money coming in, workers at the bottom of the labour market can’t choose. They don’t have flexibility. They can’t use reviews to pick a better employer. Choice is an illusion without income security. That’s why, if you want to build workertech that really helps workers in this fast-changing world, you’ve got to think about power. A long time ago, also in a fast-changing world, workers came up with an innovation that really did help improve their lot. During the industrial revolution. They spotted that together, pooling their interests, in common cause, workers could create a new source of power to take on the bad bosses. The bosses needed their labour — to run the factory, the mine or the shop. And the threat to withdraw it evened up the balance, brought the bosses to the table, meant they had to negotiate. And things got better as workers used that power to push bosses to pay more, improve safety, win paid holidays. It was a revelation: the realisation that working people together had power that meant they didn’t have to put up with exploitation. Equal societies require a strong union movement, turning workers’collective power into change — and that change brings better conditions, fairer pay, more equal treatment. At a time when incomes still haven’t returned to the levels of 2008 and when new forms of exploitation are multiplying, we need stronger unions more than ever. I know that unions haven’t always kept pace with changes in the labour market — or in how we live our lives. We’re legacy institutions — a little bit dinosaur!— well into our second century. Now union density is now below 25% — it’s 6% amongst private sector workers under 30 — , and most private sector workers have never been in a union. They work in workplaces where there are no union members, let alone union reps.
We know. The problem is urgent. Lots of us in unions get the need to change. And there is some genuine innovation going on in unions — innovation that builds on the core insight of collective power. People ask: why don’t unions organise the self-employed? And I say: but we do. Just look at the union-led sector frameworks for workers in performance, music, broadcast that set minimum standards and stop undercutting. The challenge is to get the tools — sector agreements, worker co-ops — to more groups of genuinely self-employed and freelance workers. Balancing up the power between workers and bosses, through the collective. And we use our collective power in the courts — cash built up by generations of workers, giving ordinary workers the power to challenge employers. Look at the huge win the GMB union have just had against bogus self-employment at Uber. And we build on the collective power of customers and workers together in social movements — consumer and worker power delivering big changes at Sports Direct and Pizza Express. But there’s far more to do. The union model has never been bettered for raising standards for ordinary workers. So I’m here today to say this: we get the challenge, and we need your help. My hunch is that tech can help us solve the big problems. Think — for example — about how tech could help workers get the stability of hours they want to work through a shift exchange — taking power away from the boss and giving it to the workers. What can tech do to help stamp out pregnancy discrimination, underpayment of wages and all the other problems we face — and build bonds between groups of workers? We need a strong field working for the same goal: great jobs for everyone. Not in competition, but alongside each other. That’s why I’m delighted to be here tonight, lending the support of the TUC and asking for your help. 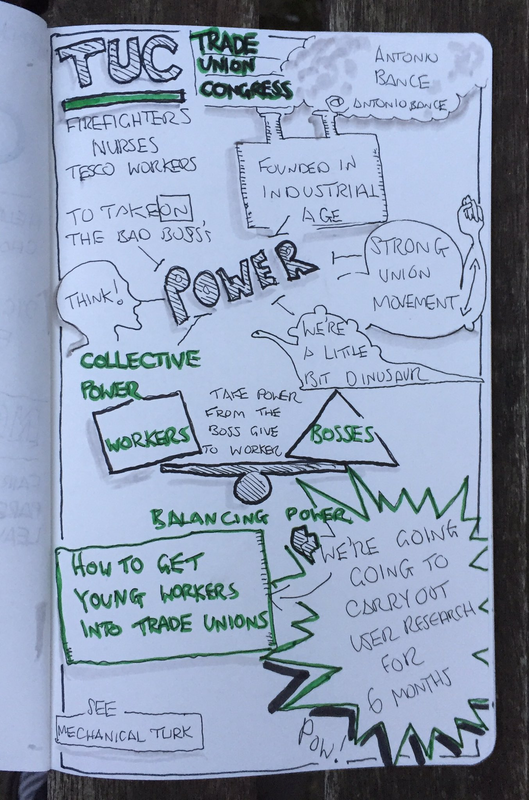 And my tip — if you’re up for the challenge of building some workertech — is this: start by thinking about power. The best way to build new power is through the collective action of workers. So help us build a new trade union offer for a new generation of workers, using great tech AND the collective to level up between bosses and workers. Thank you. In comments after, I was asked (quite rightly) what the TUC is doing in this space. I was glad to be asked: we are shortly kicking off a partnership with the clever bods at Good Innovation to develop a new set of propositions and products to appeal to Britain’s young core workers. We start with lots of user research… I look forward to sharing the insights as the programme gets going!